Rozzi's Lakeshore Tavern & Restaurant | Out to Eat | Kids VT - small people, big ideas! An establishment with the word "tavern" in its name doesn't immediately conjure up images of kid-friendly dining. Though bars tend to be more understanding than restaurants about loud voices, spilled beverages and food that ends up on the floor, concerns about boisterous and intoxicated patrons often keep parents from bringing their children to a place with neon beer signs in the front window. My wife, Stacy, and I initially had some reservations about bringing Manya, our toddler, into Rozzi's Lakeshore Tavern & Restaurant. The popular neighborhood bar is just minutes from our house in Malletts Bay. To our pleasant surprise, however, Rozzi's proved to be much more child friendly than we expected, and has since become a regular spot for us to grab lunch or dinner. Located at the T intersection of West Lakeshore Drive and Prim Road, Rozzi's is first and foremost a burger-lover's paradise. With 30 different varieties on the menu, most children and adults can find something to satisfy their palate. Among the odder choices: the Escargot Burger, topped with provolone cheese and snails; the Goober Burger, topped with peanut butter, mayonnaise and pickles; and the Elvis Burger, made with peanut butter and fried bananas. During our recent visit, Stacy had the Flower Power II with sweet-potato fries ($7.99), one of two veggie-burger options on the menu, which she definitely enjoyed. 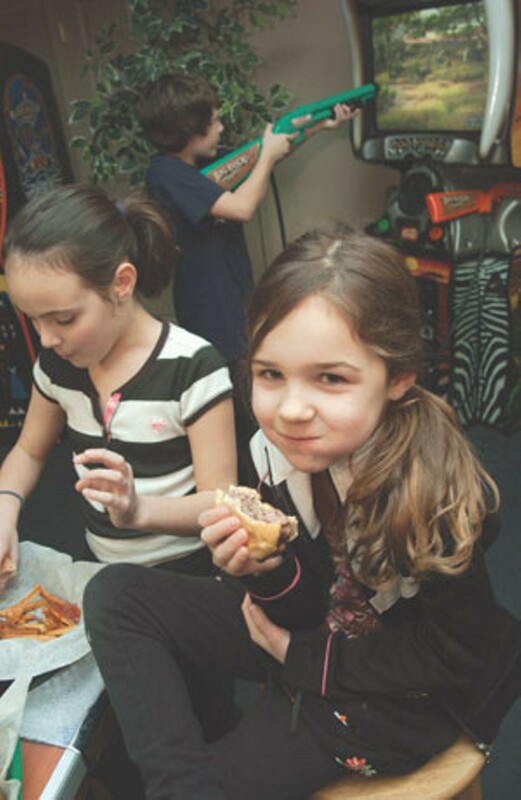 For the younger nibblers, the kids menu offers the expected fare, such as chicken tenders, mozzarella sticks, hot dogs, corn dogs and PB&J sandwiches. The 11 kids menu items range from $3.99 to $5.99 and are served with French fries — though healthier substitutions, such as slaw, sweet-potato fries, mashed potatoes with gravy or steamed vegetables, are also available. There's also a kids brunch menu, which features omelettes, pancakes, French toast, and sausage and gravy. On our last visit, Manya had the fried mac-'n'-cheese wedges ($5.99). Despite her hearty appetite (and predatory nibbling by others at the table), she still had plenty of food left over for the following day's lunch. For the adult eaters, Rozzi's menu has lots of non-bar-food items to choose from. They include prime rib, chicken Cordon Bleu, broiled sea scallops and fried, whole-belly clams. All are reasonably priced and tasty. On our last visit, I ordered the barbecued ribs with mashed potatoes and coleslaw ($10.99). The ribs were thick, meaty and delicious. Since Rozzi's is only a short walk from the Malletts Bay boat ramp, the staff is prepared for patrons who show up with children. Aside from the ample supply of high chairs, the dining room is also stocked with games, coloring books, TV sets and stuffed animals to keep the tots occupied until their curly fries arrive. In warmer weather, there are yard games to play outside, in an area roped off from the parking lot. "Out to Eat" is a monthly family-friendly restaurant review. Where should we eat next? Email us at ideas@kidsvt.com. Ken Picard is a staff writer at Seven Days. L-R Kelsey Leggett, age 9 and Kyle Leggett, age 11, of Richmond; Mercedes Rozzi, age 6, of S. Burlington. Family-friendly amenities: Kids menu; high chairs and booster seats; games, coloring books, stuffed animals and TV sets to keep kids occupied. Beware — no changing tables in the restrooms! Our bill for three: $35 + beer and tip.